The fifth edition of the OTPM came out in 2015. This is the paperback reprint and costs only about one-third of the hardback edition – definitely value for money. So, here it is. The Fifth Edition of the OTPM, 22 years after Derek Doyle’s first exploit and appropriately dedicated to the late Geoffrey Hanks, who had been involved from the outset and was senior editor of the 4th edition. At first glance, it’s pretty impressive, with 1,200-odd pages and 234 contributors. Looking through the Table of Contents, it is reasonably organized, as you would expect of a 5th edition. Section 1 is about the worldwide status of palliative care and I was pleased to see Liliana de Lima and the IAHPC Project on Essential Medicines for Palliative Care featured. Section 2 is about the challenge of palliative medicine. Section 3 is about delivering palliative care in different settings. Section 4 is about the interdisciplinary team. Section 5 is about ethical issues and contains an interesting chapter about whether we should accept physician-assisted death as part of palliative care. Section 6 is about communication. Section 7 is about assessment tools and informatics. This is followed by sections on common symptoms (8), pain (9), gastrointestinal symptoms (10), and skin problems (11). Section 12 is about palliative care in cancer patients, followed by sections on cancer pain syndromes (13) and cancer-associated syndromes (14). Section 15 is about non-cancer illnesses. The chapter on HIV/AIDS raised my ire and is discussed below. The other chapters provide reasonable coverage of end-stage pulmonary, cardiac, renal, and neurological disease. Section 16 discusses the very young and the very old. Section 17 is about psychosocial matters. Section 18 is about the terminal phase and I felt this (important) material should have been presented in earlier sections; it’s sort of left hanging out there to dry between psychiatry and research at the end of the book. The final section is about research in palliative medicine. Thumbing through the chapters, I noticed a lot of updating but nothing radically new. I was frustrated on several occasions by not having access to quoted references. In some chapters, all the references are presented, but in others you have to go to the website, which I thought was a hassle. I’m old fashioned, and think that for this price, you should get the references. 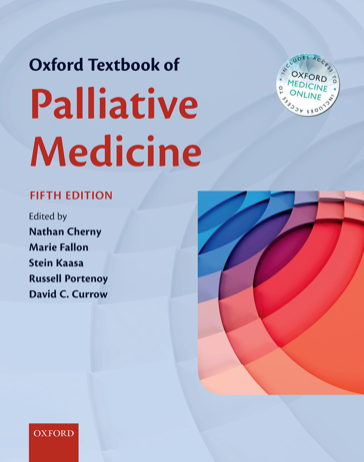 If it’s a purely economic question, there are at least three chapters in this book that are made redundant by The Oxford Textbook of Palliative Care for Children 2nd Edition (which did not exist when the first few editions of OTPM came out). And the use of numeric references to replace the author/date system used would save pages. The chapter on ‘Barriers to Palliative Care’ provides a reasonable overview of the international situation and I am aware of the mountains that those in developing countries face. Ethnic, cultural, and religious minorities in developed countries are discussed, but probably account for only a small fraction of those not referred and I thought the discussion needed to be much wider. Take a rich country like Australia (with universal health coverage that includes palliative care) — what are the personal, societal, professional, and institutional barriers that result in large numbers of patients who might benefit from palliative care being either not referred or not in a timely fashion? The chapter on ‘Euthanasia and Palliative Care’ provides a good discussion about the meaning and ambiguity of many terms used to discuss the need for physician-assisted death, and for two authors whose first language is not English, they have done a pretty good job. But there are no progress figures given for the various places where physician-assisted death is practised, or the level of abuse (e.g. euthanasia without request in The Netherlands), which I would have liked to see. How the Belgians talk about physician-assisted death being a normal and necessary part of palliative care (‘palliative care and euthanasia are neither alternatives nor opposites’), is a little beyond me. This chapter is more about the possible forced inclusion of physician-assisted death into palliative care in the future, which makes it important reading. Whilst the proponents of physician-assisted death go on about unrelieved pain and the inability of palliative care to resolve 100% of symptoms, I note the most frequent reasons for people going down the assisted death path in Switzerland are existential distress and the fear of loss of control; quite similar to Oregon, where concerns about pain are sixth on the list and losing autonomy, the diminished ability to engage in life’s enjoyable activities, and loss of dignity consistently head the list. The preamble to the chapter on HIV/AIDS — that they are only going to discuss a small number of patients who live in a rich country and who are on optimal therapy — is quite unacceptable and should have been recognized as such by the responsible editor(s). It is stated that HIV/AIDS in the USA is a different disease than in the era before effective antiretroviral therapy (ART), and that treated patients can have near-normal life expectancy. And as such, the palliative care needs of these patients has shifted from the treatment of opportunistic infections and end-of-life care, to ‘symptom management, co-morbidity disease management, and chronic care-coordination.’ But then they say that only two-thirds of diagnosed patients in the USA get such care and, of these, 10% do not stay in care. So what about the palliative and end-of-life care needs of the 40% of patients who do not get optimal therapy? You can bet they are not going to have a near-normal life expectancy. There is a reasonable discussion about pain, because that remains a major problem even in those on optimal treatment. It is noted that even patients on optimal therapy have very high symptom burdens, but treatment isn’t discussed. I was told to remember that many HIV-infected patients who die are not dying of HIV/AIDS but of co-morbidities; does it matter whether they die from HIV/AIDS or from something else that is in some way (as yet incompletely understood) related to their HIV infection or its treatment? It made me wonder if all these deaths ‘not due to AIDS’ contributed to the euphemistic statistical projections about near-normal life expectancy. Whilst we are still on the USA, it states that ‘women are also disproportionally affected’ and says that of the 1.1 million people with HIV infection, 280,000 were female. When it comes to the rest of the world, the coverage is appalling. ‘As of 2009, 33 million people were living with HIV infection…[but] over 4 million people are on ART in low-and middle-income countries…’ Doesn’t that mean that 29 million were not? Hardly a word about their clinical course or palliative care needs. In a textbook with an international audience and advertising an ‘international team’ of editors, that is tantamount to saying they don’t matter. The latest figures on the UNAIDS website are for 2012 and show that, outside North America, about 1,580,000 people died of HIV/AIDS (www.unaids.org). So what about the palliative medical and psychosocial needs of the 29,000,000 people not on ART, and the end-of-life care needs of the 1,580,000 people who died? Oxford, please make a note — for the next few editions at least, please insist on someone from sub-Saharan Africa (or a similar place) writing a chapter on palliative care for HIV/AIDS as it occurs in the developing world. So, how does OTPM 5th Ed. rate, overall? It’s updated, well organized, and the coverage is good (with a few exceptions). I think it remains the best book on palliative medicine on the market. Dr. Kathryn Mannix is a palliative care consultant based at the Royal Victoria Infirmary in Newcastle upon Tyne, UK. It sounds as though her specialist career started in oncology, after which she moved into the new discipline of palliative medicine, a career path that seemed remarkably familiar to me. Having qualified as a cognitive behavior therapist in 1993, she started the UK’s first CBT clinic exclusively for palliative care patients. The book is essentially made up of 30 clinical stories of people at or nearing the ends of their lives, ‘and the intention is to allow the reader to experience what happens...how they cope; how they live; what matters most; how dying evolves; what a deathbed is like; how families react.’ The stories are grouped under six headings and gradually progress from more objective things (physical changes, patterns of behavior, and dealing with symptoms) to more abstract concepts like making sense of human impermanence, assessing what has truly been important to a given individual, and our legacy. Written primarily for the lay reader, there is a little explanatory introduction to each story and a short critique at the end of each section. I thought the stories were well chosen and well told. I enjoyed reading them and learned a little bit about CBT along the way. I wholly agree with what she is doing, but how do you get the masses to read this type of book? How do you get them to talk about death and dying? Many health care professionals go out of their way to avoid talking about death and dying, and the patients and their families see evidence of miraculous breakthroughs in medical science every night on the TV news. Anyone who works in palliative care will find this book enjoyable to read and there are a large number of clinical issues to ponder. Whilst I could argue that we as a profession should be somehow advocating this book, it is difficult to know how to go about it. When I did a little research into Dr. Mannix’s background, I came across some comments she made at the time of the euthanasia debate in the House of Lords (The Guardian, 12 October 2005). ‘The bill to legalise assistance with dying arises from the argument that to deny assistance is to deny the autonomy, or right to choose, of an individual. Proponents describe this denial as dehumanising, as though exercise of autonomy alone is the mark of human personhood. The humanising aspect of choice is its potential for nobility: as humans, we can reflect on our being and on the consequences of our choices. 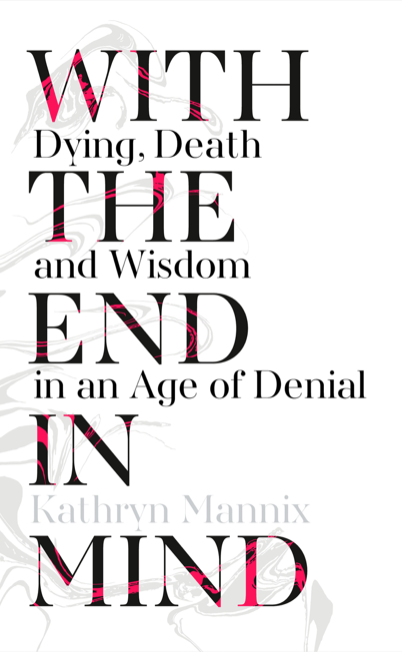 The right to choose to die with medical assistance, when placed in this context, must be weighed against the nobility of relinquishing this right if its commission would damage other, possibly more vulnerable, members of our society.’ I liked that, and it reflects the same clarity of mind evidenced in her book. But I was writing this during the week that the parliamentarians in my own State of Victoria legislated to approve physician-assisted death and euthanasia, although I suppose words like those of Dr. Mannix would have gone straight over their heads. Now the leader of the federal Greens, a medical practitioner who dumped medicine to go into politics, is loudly championing the cause for the legalization of euthanasia in all Australian States and Territories. 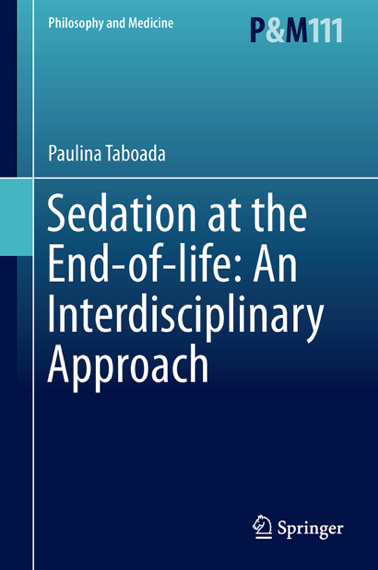 The purpose of this book is to analyze several clinical, ethical, and legal questions related to the use of sedation at the end of life, also termed palliative sedation (PS). In her introduction, Taboada explains that it is focused on seven questions: is PS ethically different to euthanasia and physician-assisted suicide; is it necessary to invoke the principle of double effect to justify PS; is PS ethical in patients not imminently dying; are decisions about nutrition and hydration independent of decisions regarding PS; is PS appropriate for psycho-spiritual symptoms and existential suffering; is PS ethical for patients unable to give informed consent; and, are clinical guidelines for PS desirable. I was impressed by the standard of the contributions to this book, which seemed thoughtful and well organized. The uniformity of presentation suggested good editing. Whilst considered answers are offered to some of the questions, an alternate view never seems far away. No one would argue about the minefield of different terms, concepts, and definitions. Should there be indications for PS, or should it be based on the wider ‘goals of care’ that we use in palliative care? The question of PS for existential suffering raises further questions of how you define and assess that type of suffering. Much is said about the principle of double effects, which if used properly does differentiate PS from euthanasia; at the same time it is admitted that some uses of PS may in fact be intentional killing. When it comes to guidelines, one expert argues in favor, whilst another decries their use because they have a very negative effect on judicious medical decision-making. I was particularly taken by the cogent arguments, by John Keown and others, regarding autonomy. ‘In spite of the undeniable importance of respect for ‘autonomy,’ both for patients and also for health professionals, respect for autonomy should always be subordinated to the respect we owe to the ‘basic human goods’ of which the first and most important one is life itself.’ Hear, hear! And it’s been known and believed for a long time — it’s not something that has just been discovered. But the parliamentarians in my home State of Victoria are much wiser and have passed legislation to legalize euthanasia and physician-assisted suicide for the sole purpose of giving the power of autonomy to the individual. Paulina Taboada is from the Center for Bioethics and Department of Internal Medicine at Pontificia Universidad Católica de Chile in Santiago, Chile. The other contributors, experts in bioethics or palliative care, were from Canada (8), Chile (2), and the USA (2). This scholarly and detailed book reviews the history of terminal care from the late Middle Ages to the present and is focused primarily on Western Europe. The first section deals with the period from the late Middle Ages up to the turn of the 19th century. Stolberg traces the earliest reports of palliative and terminal care — cura palliative and euthanasia medicinalis. I learnt about the historia mortis that were popular in Pietist circles before 1800. And the doctors had competition back then: there are some wonderful stories like the empiricus who relieved the noblewoman Balthasar Timaus von Guldenklee of the agonizing itch she had suffered since contracting syphilis from her husband, and who was richly rewarded, but the lady still died of her syphilis. The second section covers the period from the late 18th century up to around 1970. The first big change was the development of institutional care for the incurables, the consumptives, and those with cancer. Although the first hospices for the dying were said to have been started in the late 1800s, Stolberg claims the Krankenhaus Hundertsuppe in Nuremberg was functioning as a hospice for the dying before 1800. The first institution founded with the explicit aim to care primarily for terminally ill and dying patients was Our Lady’s Hospice for the Dying in Harold’s Cross near Dublin, opened in 1879 by the Irish Sisters of Charity. There is a good description of the establishment of St Christopher’s by Cicely Saunders and the Palliative Care Unit at The Royal Victoria Hospital in Montreal by Balfour Mount, together with a discussion about whether free-standing hospices contributed to marginalization of dying. Along the way, there are discussions of evolving attitudes to such things as communicating fatal prognoses, the difficulties of prognostication, truth at the sickbed, and the ‘art’ of dying. Euthanasia cropped up all over the place. Sir Francis Bacon (1561-1626) coined the term to mean gentle or easeful dying, and believed strongly that the doctor had a responsibility to help the dying patients die a gentle death, the death that resembled a friendly, pleasant sleep. So, euthanasia originally referred to the gentle death and the medical activities designed to ensure such a death, in contrast to the active, intentional shortening of life. However, deliberate shortening of life was being practised as early as 1800. The chapter detailing the evolution of euthanasia as we know it today, including what happened in Nazi Germany, is interesting. 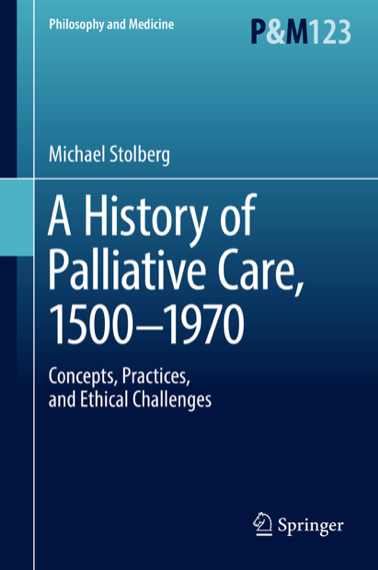 In the concluding chapters there are discussions about medicalization of terminal care, the stigmatization that goes with death and dying, and what Stolberg refers to as ‘the tendency to taboo and repress death.’ It’s an amazing ride — the growing place of terminal care from the late Middle Ages until about 1850, its marginalization in the following hundred years, and its renaissance after World War II. Michael Stolberg is from the Institut für Geschichte der Medizin at the Universität Würzburg in Germany. The present volume is the English translation of a 2011 German publication, although no translator is acknowledged. Dr. Kim Kuebler, DNP, was the director and founder of the Multiple Chronic Conditions Resource Center and CEO of Advanced Disease Concepts LLC in Savannah, Georgia, USA, although Google suggests she has now moved to Oregon. This book is exactly what the title says. It’s purpose ‘is to provide interdisciplinary health care teams with a road map to ensure best practices in the care and management of the largest, fastest growing, and costliest U.S. patient population — those with multiple chronic conditions.’ People have talked for years about incorporating the principles developed or rediscovered by palliative care into the mainstream management of chronic diseases. A few of the texts dealing with palliative care for non-malignant conditions included material on the management of chronic, non-terminal disease, but this book is the first systematic attempt to address the issues that I have seen. The book is divided into seven sections. 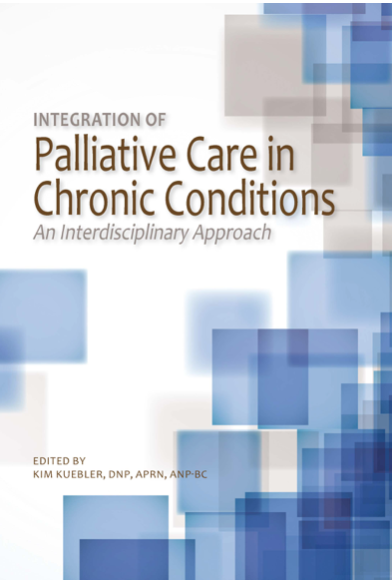 The first gives an overview of palliative care and how it is appropriate for the management of chronic conditions; there is stuff about patient-centered care, patient involvement in their care, and the research on comparative effectiveness. Section II is about the pharmacology of palliative care; whilst the description of the underlying principles is good, I felt it lacked clinical detail. A comprehensive description of what is touched on here would require 500 pages of its own, and I think practitioners need access to an Internet database that offers comprehensive information about drugs and drug interactions. Section III is about chronic conditions with chapters on cardiac, renal, pulmonary, endocrine, malignant, and neurological disease; again, the outline is good but the clinical detail is lacking and the neurology chapter doesn’t mention motor neurone disease. Section IV consists of 10 chapters on symptom control. Section V is about oncological emergencies; I was a little curious why, in a book stressing the need for palliative care in the management of non-malignant conditions, there was little or no information about the medical emergencies that might occur with those conditions. Section VI is about palliative care practices including communication, advance care planning, goal setting, and cultural considerations. I did not see anything about assisted dying, which I think will become one of the most difficult aspects of looking after the dying and those with chronic conditions over the next few years. The misguided politicians in my home State of Victoria, who see themselves as both far-sighted and caring, have recently passed legislation to legalize euthanasia and assisted suicide. So now we have to be able to talk to the ones who want it, as well as to those who do not want it but are scared they’re going to get it. The final section is about spiritual care for patients and self-care for the professionals. One thing that I particularly liked about this book was that the whole text (except for the short case studies) is written in list form. Lots of headings and not one paragraph of waffle. I completely agree with what Kuebler is trying to do — incorporate what I call the principles of palliative care into the management of chronic conditions. My concern is that some of the clinical discussion seemed limited or superficial, yet I am aware that to cover all the common conditions and treatment would result in a book at least two or three times larger. But if you accept Kuebler’s description of this book as a road map or outline, then I’d say it’s very good and would be a worthy addition to the bookshelf in any palliative care unit. Every now and then, a book comes along that you feel quite unable to assess, never mind judge. That is the case with this book, but I shall attempt to describe it. The book is dedicated to the author’s recently deceased wife, Deborah Glaefke Gilbert, a university academic who we are told suffered for a long time with MS and lupus, but died of lung cancer attributed to asbestos exposure. 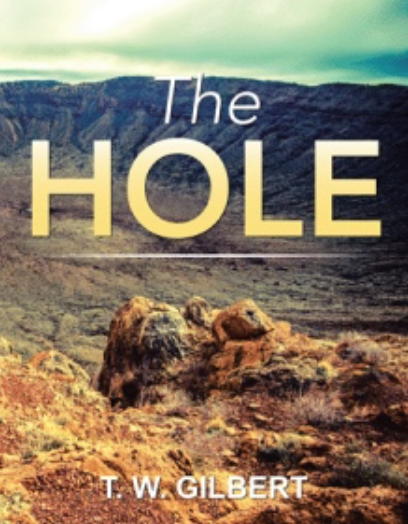 The book is a reflection on the author’s grief and loss, which he describes as devastating. Each two-page spread has text on the left hand side, and a large photograph on the right. The text is written in a new poetic form, which the author claims to have invented and named ‘The Glaefke Sonnet.’ He describes is as ‘both a five-stanza ballad and a Shakespearian sonnet; both forms contain 140 syllables. Every tenth syllable and every fourteenth syllable rhyme.’ I think I know what all that means…but I’m not sure. Gilbert describes himself as a poet, although his main profession is in the field of special education and intellectual disabilities. I can make no judgment, in either direction, as to whether this book would be useful to other bereaved and grieving individuals. If your work involves a significant amount of grief counselling, you should know that this book exists.